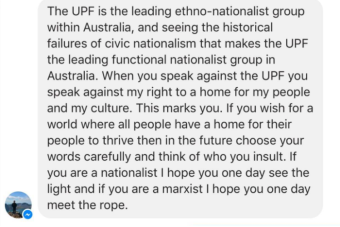 A Melbourne man has revealed Christchurch shooter Brenton Tarrant sent him a death threat after he criticised the United Patriots Front (UPF) ahead of a 2016 anti-refugee rally. The ABC has obtained screenshots of a Facebook messenger conversation between the man and Tarrant from August that year in which the alleged mass murderer said “I hope one day you meet the rope”. In the exchange, Tarrant defended the UPF — an anti-immigration group — as “the leading ethno-nationalist group within Australia”. “When you speak against the UPF you speak against my right to a home for my people and my culture,” Tarrant wrote. Tarrant warned the man to “choose your words carefully” and “think of who you insult”. The recipient of the threat, who wanted to remain anonymous, said he went to Eltham police station in September 2016 with a copy of the conversation to warn officers Tarrant could be dangerous. He claimed police advised him to block Tarrant on social media and did not take an official statement. The man said he was shocked when he heard news of the Christchurch shooting, and realised he had a run-in with Tarrant years earlier. “I feel a sense of guilt and have been beating myself up,” he told the ABC. In a statement, Victoria Police said that based on the information provided to them by the ABC, they had been “unable to locate a complaint made by the victim in 2016”. The man said he attracted Tarrant’s ire after criticizing former UPF leader and neo-Nazi Blair Cottrell ahead of the rally in Eltham. An investigation by ABC’s Background Briefing last month revealed Tarrant had offered allegiance to Mr Cottrell around the same time and even referred to him as “Emperor” on Facebook. The Facebook messenger exchange is the second recorded instance of Tarrant using the words “meet the rope” when referring critics of the white nationalist movement. The phrase is from a white supremacist novel, which has inspired hate crimes and terrorism, and alludes to a public execution of “race traitors” such as professors, lawyers and journalists. 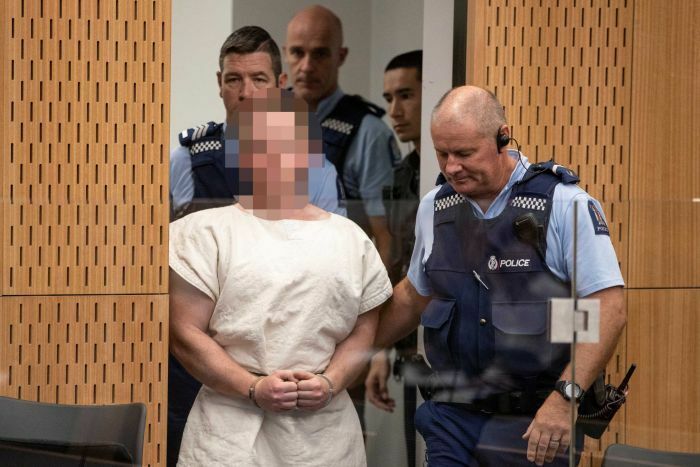 Tarrant had no prior convictions before the March 15 attack and was not on any Australian or New Zealand watchlist. 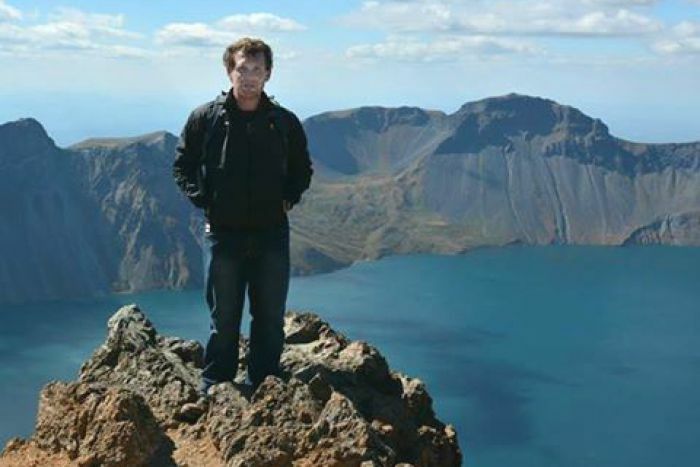 Security and intelligence agencies around the globe have been scrutinising his travels across Asia and Europe since the shooting to determine whether he had any formal connections to hate groups. Last month, the Austrian Government confirmed Tarrant made a “disproportionately high donation” to the white nationalist group Identitarian Movement in 2018. The ABC also revealed the alleged mass murderer identified his targets two days before the shooting, on the same social media account that was used to livestream the attack. In a series of posts on March 13 — recovered from a partial cache from his now-deleted Facebook page — the alleged killer posted a picture of the Noor mosque. The discovery raised fresh questions about what security agencies and police could or should have known about the impending attack. Tarrant, who has been charged over the 50 deaths, has been remanded in custody until June 14 and will undergo a mental health assessment.